Lobster is a delicacy that is very easy to make and inexpensive to make at home compared to ordering at a restaurant. This appetizer uses only the claws and any arm meat that can be extracted. The tail can be used for a delectable main entrée as is with melted butter or make Lobster Imperial with the remaining tail. Lemon Infused Extra Virgin Olive Oil is being used and can be purchased on-line at Spicewood Food Company. This appetizer is paired with a few higher priced Chardonnays. They are justifiable because of the money saved by creating an appetizer and a main entrée with just one lobster. Serves 2. Fill a very large pot or stock pot half way with water and bring to a boil. Place live lobster into boiling water head first. Cover and boil for 10 minutes. After 10 minutes the lobster should be a deep red color. Remove from the pot and let cool for a few minutes. When cool enough to handle, twist each claw off at the base of the body of the lobster. Place claw on a hard surface and cover with a towel. Hit claw with the palm of your hand to break claw shell. One may have to hit the claw a couple of times to break. Once broken, the claw meat will easily come out of the shell. Remove all lobster meat form joint and arm of the lobster. Take remaining lobster tail and cut all the way down the center lengthwise with kitchen shears. Remove tail and rinse for a separate dish. For a step-by-step process of removing the lobster meat see How to Remove Lobster Meat technique. Place all lobster meat into a small bowl and place into fridge until ready to serve. 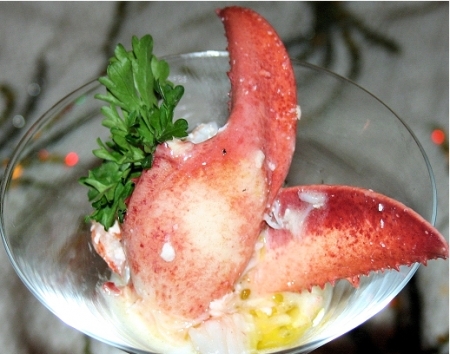 Once ready to serve, place equal amounts of lobster claw meat into two martini glasses. Heat vodka in medium skillet over medium high heat. Be careful when working with the vodka over a flame, because it can flare up. Make sure you use a large enough skillet to avoid this happening. Also, make sure a lid is near by to place over top of the skillet in the unlikelihood you do experience a flare up. Reduce by half and add butter. Whisk together. Once combined pour butter vodka mixture evenly over lobster claw meat. Garnish with parsley and a small drizzle of lemon infused oil. Use lemon infused oil only for a more robust lemon zing. If you don’t have this, fresh lemon juice would work too. Remember just a hint of it. For a splurge that is well worth the money, try Rombauer Vineyards Carneros Chardonnay (California) or Karl Wente Nth° Chardonnay. Or try J. Lohr Arroyo Seco Riverstone Chardonnay (California) or Rodney Strong Chardonnay (California) that are more reasonably priced.